The Outer Banks of North Carolina are a world-renowned destination for beachgoing, fishing, and more. But what many visitors to the area don’t know is that the beautiful blue waves also hide centuries-old stories. The area off North Carolina is known as the Graveyard of the Atlantic, named for the many shipwrecks that came to an untimely end here. 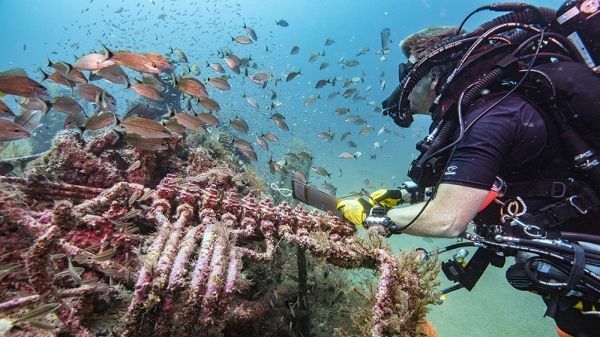 This summer, researchers from Monitor National Marine Sanctuary and its partners visited and documented two of the wrecks that now rest on the ocean floor: the submarine USS Tarpon, and the passenger liner Proteus. While both wrecks are popular dive sites, neither had ever been documented before by maritime archaeologists. USS Tarpon has an especially storied history. The naval submarine operated in the Pacific throughout World War II, beginning its war patrol two days after the attack on Pearl Harbor. Throughout its tour, Tarpon sank several Japanese vessels, and became the first U.S. submarine to sink a German raider in the Pacific. For its service in World War II, the submarine earned seven battle stars denoting its accomplishments as a warship. After the end of the war, Tarpon was decommissioned and became a training submarine for the 8th Naval District, based in New Orleans. In 1956, it was sold for scrap – but before it could be broken up, it sank while under tow off the coast of Cape Hatteras, North Carolina. There it has rested ever since. At 135 feet depth, it is a draw for experienced divers and for an abundance of marine life.